Lurline's Place: Ready for Quilting! Thank goodness! This 'little treasure' has caused me a bit of anxiety - I guess it is trying to make a dolly quilt to please somebody else - it still looks 'very Lurline', to me! It is a warm, dull day here today - a chance of rain, I hope! Consequently, the background to this pic is pavers out the front in the daylight - a bit of a change from our usual bright, summer sunshine! I'm a bit over this 'little treasure', so I think I will leave the quilting until later in the week. I have plenty to do to keep me busy, maybe too much and that is part of the problem! 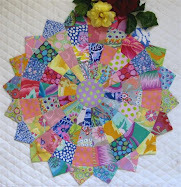 I will say, I love the Kaffe Fassett for Rowan fabric that I have used for the border - such beautiful quality! I'm looking forward to having my sewing machine serviced - poor little girl seems a bit sluggish! Maybe I will be able to organize to have it done in a week or two! If you would like to enter a Giveaway of 30 fat-quarters - pop over and visit Thearica of Pig Tales and Quilts - very, very generous and oh, to be so lucky - please tell her I sent you! Hope your Easter has been safe and happy! Hi Lurline, Hope you have had a wonderful Easter weekend too. The quilt is so colorful and beautiful. I hope you get the rain you are wishing for. We had a terrible storm on Friday night with rain/thunder/strong wind but no real damage. Easter Sunday has been warm, sunny with bright blue skies. It looks lovely Lurline, such bright, happy colours. Don't you just love that phrase 'ready to quilt', very under used in my house! Oh I love it so much, bright,happy, perfect, hope you had a nice Easter. didn't that turn out lovely. You worked the colours very nicely. I did love the other one too! Even if it looks "Lurline" what does it matter? She does get a dolly quilt form you doesn't she. This will remind her of you. And I love it a lot! It is always harder to make something for someone else and get it just right for them. Lurline, lovely little quilt. You did a beautiful job. Love the colors. So bright and cheery. I'm sure they'll love it! Love it. Great colors. I can't imagine the recepient wouldn't love it too. Your little quilt is just perfect!! Well it is very "lurline" and what is wrong with that??? NOthing! It is so cute. I love it. This is a design I've been wanting to play with for a while now. It turned out so cute. 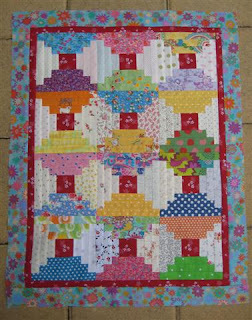 Your dolly quilt turned out very pretty! The border fabric is just perfect! The little quilt looks gorgeous. I'm sure it will be appreciated by the recipient. Thanks for sharing. It is a perfect dolly quilt. It looks lovely. It's a wonderful doll's quilt! 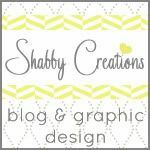 I love the fabrics you've used! That is gorgeous , I love it . Well, I like it and can't see that anyone else wouldn't. It's lovely! I love, love, loveeee your little quilt. Oh it's so sweet!